Lauren Pratt is making her debut as a recording artist with a new studio album produced by Nick Bullock. She cut her teeth on piano and continued with clarinet, but it wasn't until a guitar arrived via UPS that she found her true love. "It was a surprise gift from my uncle, but it changed everything" says Pratt. Citing influences such as James Taylor, Jennifer Knapp, and Alison Krauss, she learned ginger style guitar and folk songwriting. Lauren's classical voice training in college led to a short foray into the world of Opera until she packed her bags in and headed to Nashville. Miss Lauren Pratt is set to premiere her the video for the lead track “Days Like Tonight” with Southern Manners. Influenced by artists such as Nathaniel Rateliff and Alison Krauss, the Florida native has compiled seven tracks for her debut effort which was produced by Nick Bullock. Pratt is self-taught, musically speaking, as she first started on piano and taught herself guitar while she took to folk songwriting at an early age. In college, Pratt prepared her voice with classical training which lead to a brief stint in the world of opera. A traveler of the South, Pratt has spent time in Florida, Nashville and her college days in the Mississippi Delta where she crafted her songwriting skills. For more information on Lauren Pratt, visit her Facebook page. “Days Like Tonight” is the title track on Pratt’s forthcoming 7-song EP of the same name, which was produced by Nick Bullock and is set for release on May 26. If you’re loving the song as much as we are, you can purchase it right here and keep up with her social media pages (listed below) for upcoming info on where to pre-order the EP. It takes almost zero effort to like Levi Parham. So it's surprising that more people don't. Then again, the Oklahoma singer-songwriter is a recent addition to the Americana landscape. His home-recorded 2013 debut, An Okie Opera, was a rough-cut romp over grassy plains and along back roads, and it all but disappeared down a commercial country lane. Last December'sAvalon Drive smooths out the edges a bit, and a few more ears have started to turn in Parham's direction. He deserves the attention: Parham's voice has that timeless match of grit and tenderness, the kind of sound that puts you at ease no matter how sad the lyrics get. (And Parham, like any good Southern boy, can get pretty melancholy.) Become a believer Thursday, when Parham stops at the Riot Room. Scott Schumann, Margo May and the Blackbird Revue round out the lineup. American Songwriter premieres the full stream of Field Division’s debut EP Reverie State, out now on CD, vinyl and downloadable formats! 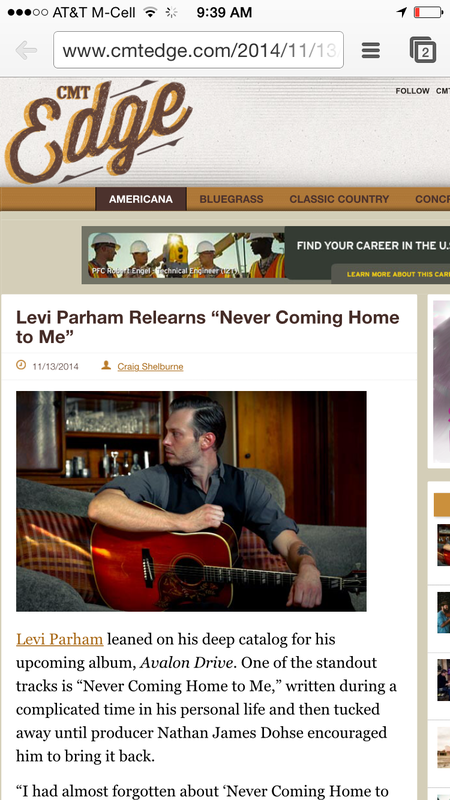 CMT Edge premiered Levi Parham's debut music video at the top of their page this morning. The video was filmed in Nashville by Jeanz Media and AGD Entertainment. More to come from Levi as he gears up for a winter release of new EP, Avalon Drive.